In case you didn’t know that Halloween is upon us once again, the fun-sized candy bars, pumpkin spice lattes, and throwaway costumes for sale everywhere you turn should be a clue. If you’re lucky enough to be traveling to Paris during this time, you’re also lucky enough to escape the holiday and all its commercialism. French citizens don’t typically celebrate Halloween and neither do their grocery stores, coffee shops, or schools. But if the spookiness surrounding October happens to make it one of your favorite months – or if you enjoy feeling chills run up and down your spine just because – Paris will not disappoint. These three tours will take your exploration of the city to deeper, darker levels. Paris Catacombs: The Paris Catacombs have sparked the curiosity of locals and visitors since the 1800s.To visit the graves of nearly six million Parisians, you’ll descend a winding staircase to a series of caverns and underground tunnels neatly stacked floor-to-ceiling with bones. It’s cool and damp, which, paired with the macabre nature of the 45-minute visit, makes for an eerie experience. The path is clear, but closed-off entryways and graffiti suggest that after-hours and not-exactly-legal visits are common. 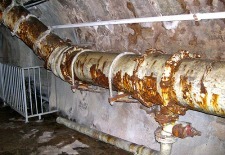 Le Musée des Égouts: Few cities would open their sewers to visitors and few tourists would accept the offer. But Paris is certainly a city with a little something for everyone. This museum invites visitors to the depths of Paris to explore a part of its sewer network and the city’s sanitation and water transportation history. The museum is surprisingly spacious, as the sewers were constructed to house large machinery, such as steam cranes and giant balls to clean drains, both of which are on display. Other items in the museum include mannequins sporting authentic sanitation uniforms, light-up models that show the city’s water cycle, and dioramas of those furry little animals who tend to call the sewers their home – rats! Le Musée des Égouts also pays homage to Eugene Belgrand, who engineered the modern sewer system, and Victor Hugo, who wrote about the sewers in great detail in Les Miserables. 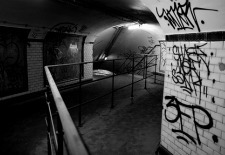 Paris ghost stations: Paris boasts one of the oldest and most extensive subway networks in the world, so it’s no surprise that some of its stations were left unfinished, abandoned, or were closed. It’s rare you’ll have an opportunity to visit one such ghost station, but with a little bit of advance planning and know-how, it’s possible. ADEMAS, the Metro Historical Association, offer tours of the subway once every four to six weeks. These popular tours fill up quickly and are limited to 30 guests, so if you see one that works for your schedule, register immediately. The half-day tours explore the history of the metro, and tour guides explain interesting details such as what materials were used in its construction. The tour finishes by passing through two ghost stations, including Saint-Martin. This station closed during World War II, reopened briefly, then closed again because another close by station could easily service riders. Early bas-relief enamel advertisements from 60 years ago still remain intact. Aside from the frozen-in-time ads, the station looks just like any other, minus the constant flux of people, noise, and trains. The silence makes for chilling experience. See our Paris Travel Guide for more trip-planning information, then use our Travel Search price comparison tool to find the lowest rates on flights, hotels, packages, and more travel deals.